Today Antutu reveals our list of the global top 10 best performing Android phones for February 2019. What are the most powerful smartphones on the mobile market right now? Check out our most updated February ranking as measured by the average Antutu score. 2. Period of data collection: February 1, 2019 to February 28, 2019. In February, the newly released Samsung S10+, powered by Exynos 9820 chipset, outperformed the Huawei Mate 20 series and topped the list with an average Antutu score reaching 332,850. The phone comes with a 6.4-inch touchscreen display and an aspect ratio of 19:9. It has 8GB of RAM, incorporates a 4,100mAh battery and supports wireless charging. 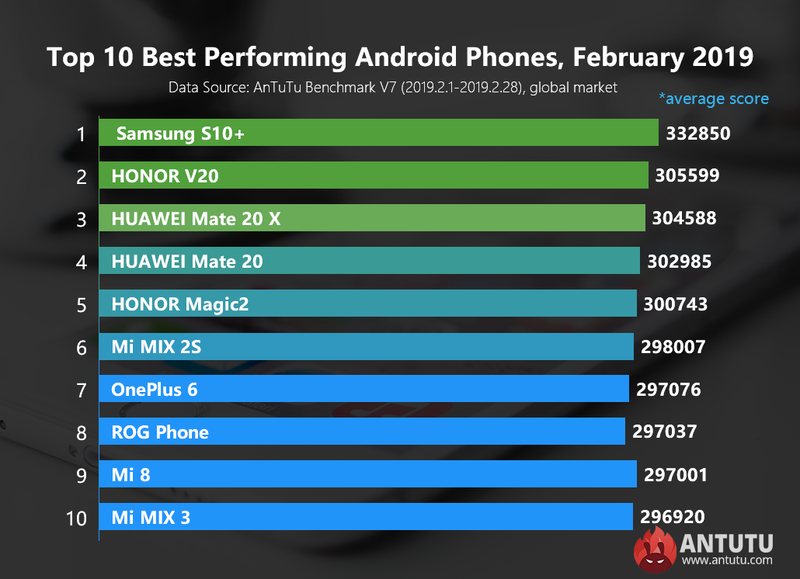 Coming in second, third, fourth and fifth places are, in order, HONOR V20, HUAWEI Mate 20 X, HUAWEI Mate 20 and HONOR Magic2, with an average Antutu score of 305,599, 304,588, 302,985 and 300,743 respectively. All of the four models are powered by Kirin 980 chipset, which is built on a 7nm process with a clock speed of up to 2.8 GHz. Taking the sixth and seventh places are Mi MIX 2S and OnePlus 6, both of which are powered by Snapdragon 845 chipset and are flagship phones under their respective brands. Making up the rest of this month’s top 10 are ROG Phone, Mi 8 and Mi MIX 3, all of which achieve an average Antutu score of over 295,000. With more smartphones powered by Snapdragon 855 coming onto the market in 2019, we expect to see more high-performance smartphones make it to the Top 10 list. The above data reflects the changes of Android phone performance for February 2019. For more information about the ranking list, please visit Antutu official website or download AnTuTu Benchmark and check in the menu of “Ranking”.